Eric Reid's grievance against the Cincinnati Bengals has been denied by an arbitrator, a decision that has irked the NFL Players Association. The union said that arbitrator Shyam Das found that the team asking Reid during a free-agent visit if he planned to kneel during the national anthem violated fair hiring practices. The union argues that standing for the anthem is not required in the labor agreement with the league. The grievance claimed that Reid wasn't signed by any team because of his anthem protests. 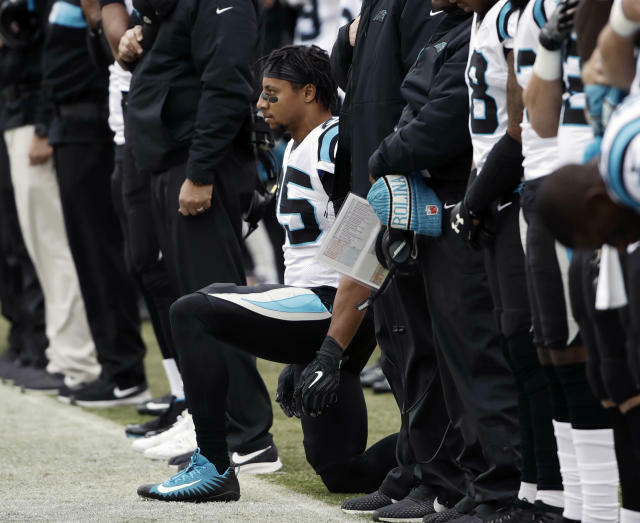 Reid is now with the Carolina Panthers, whom he joined this month and with whom he has continued to kneel during "The Star-Spangled Banner." The interview with Bengals owner Mike Brown came in April. "So when the NFLPA found out about my interaction with Mike Brown, they wanted to file the grievance on my behalf," Reid said Wednesday. "And I agreed to move forward on that on principle. "It's interesting, it kinds of smells fishy that the arbitrator ruled that I proved the facts of the case, which are that they asked me some inappropriate questions, but he ruled I didn't win the case." The Bengals said Wednesday they have no comment on the matter. The union added, "We will review the decision more carefully with Eric and his lawyers to consider our next steps." Reid filed a collusion lawsuit against the NFL because he was not signed by any team after he left the 49ers as a free agent following the 2017 season. Reid was one of the first players to join former 49ers quarterback Colin Kaepernick in his protests of social and racial injustice during the anthem. "We are going to move forward with the collusion case," the safety said. "They are completely unrelated, that case was against the Bengals individually, and that (collusion) case was against the league as a whole."